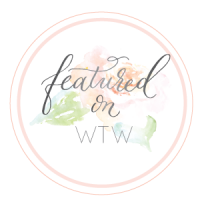 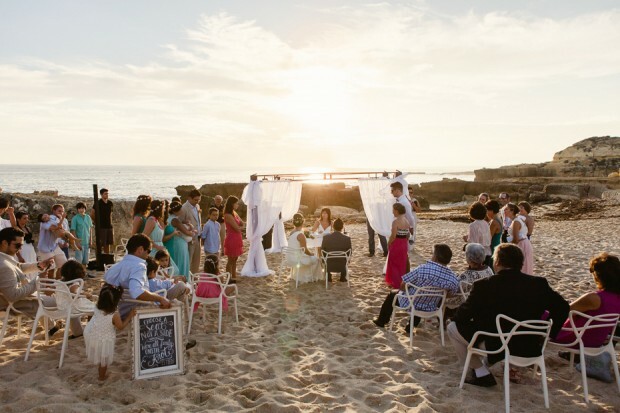 Here at WTW, I’m dreaming of beach weddings today! 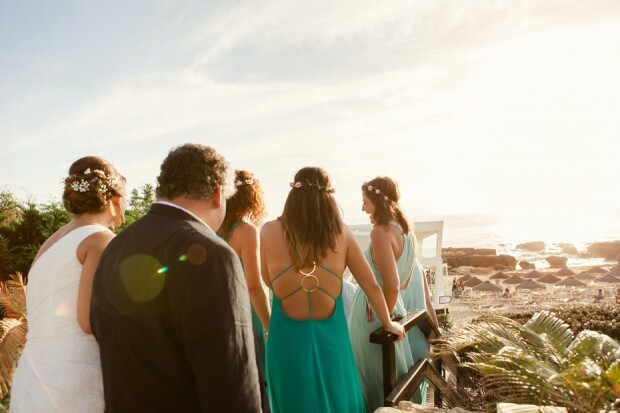 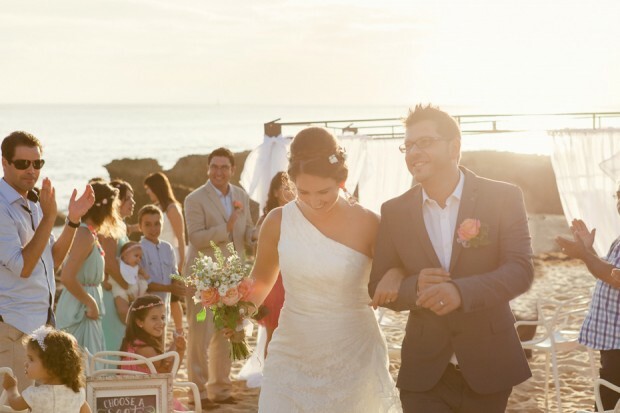 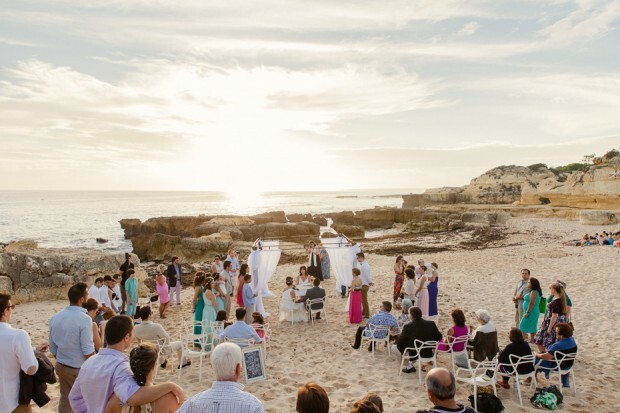 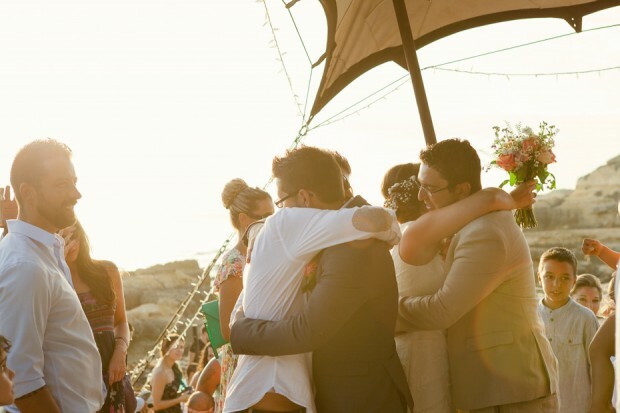 And this lovely Portuguese beach wedding at sunset, is ticking all the boxes of sheer loveliness. 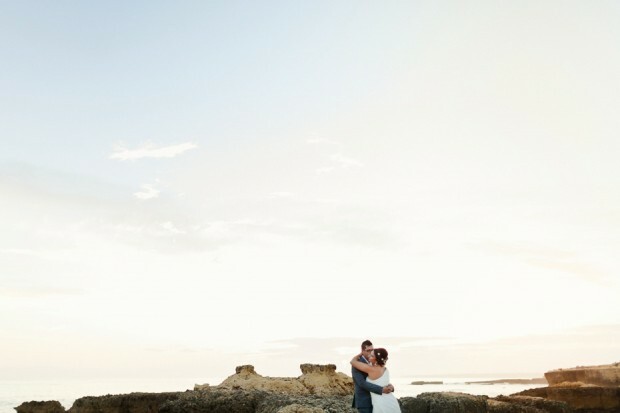 Beautiful photography and such a sweet couple, enjoy. 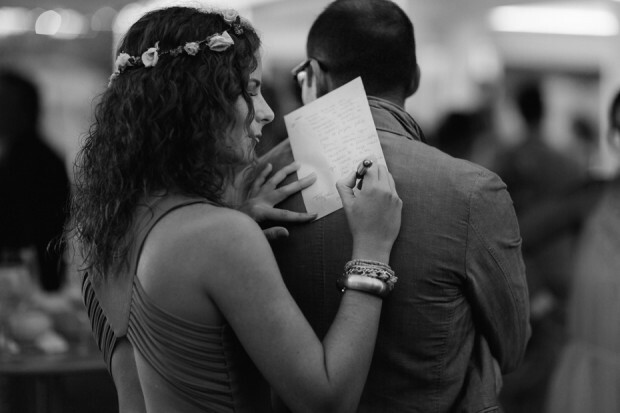 Words by Susana. 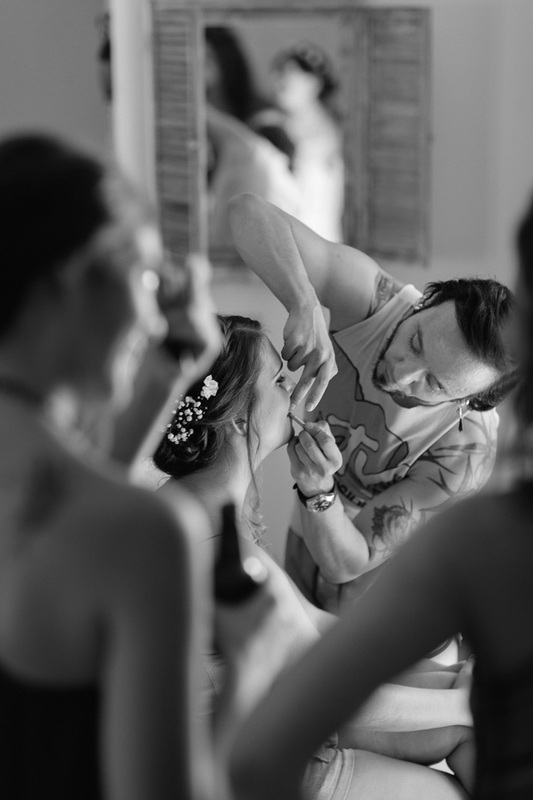 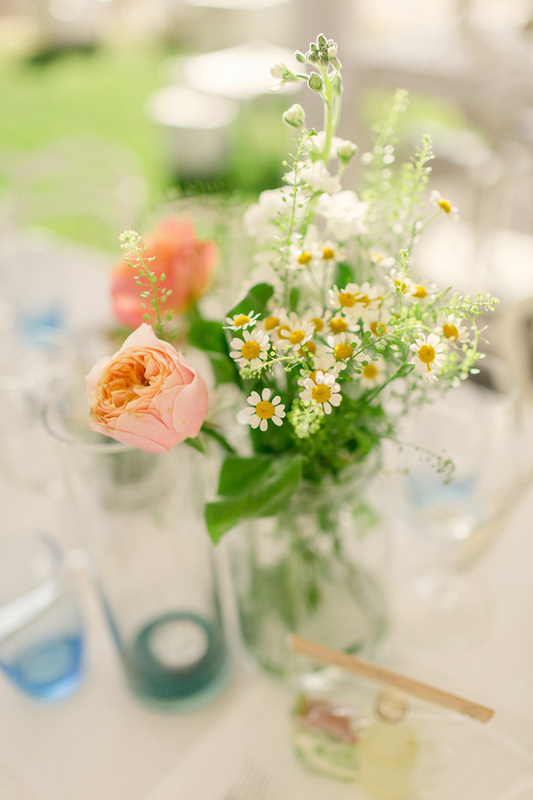 Images by Matt & Lena Photography. 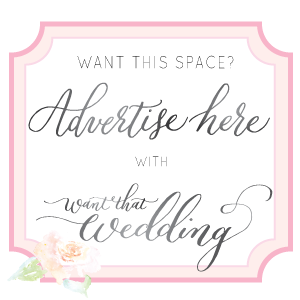 I am a wedding planner! 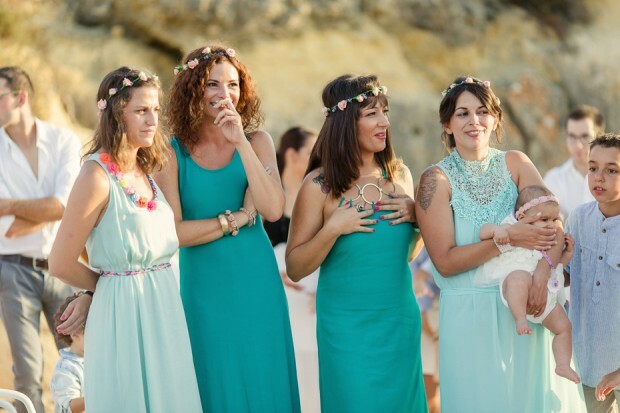 So I planned my wedding and had my friend coordinate the initial part of the day. 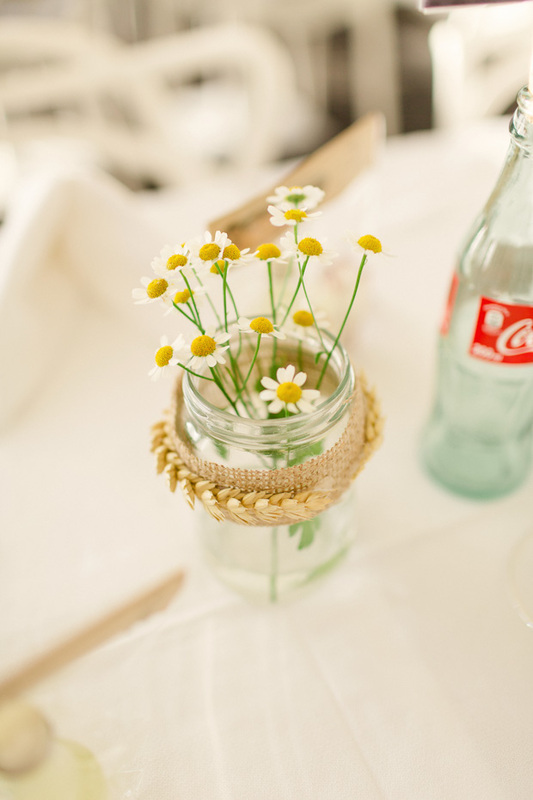 I’ve always liked the vintage look. 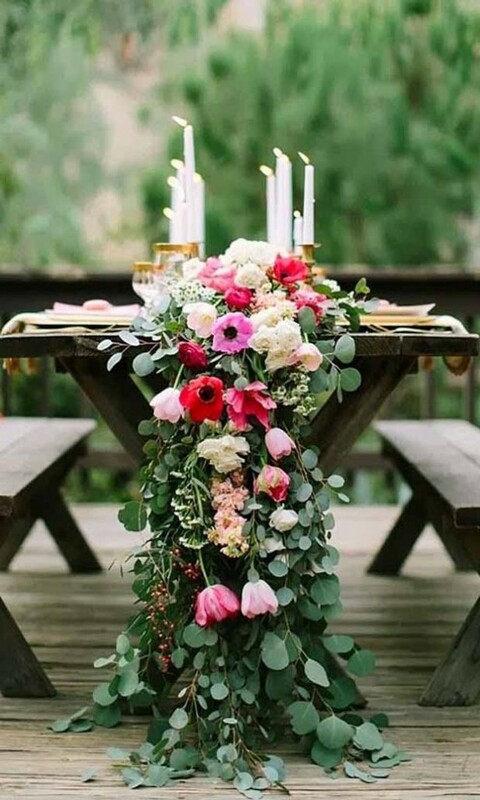 So when it came to my wedding I went crazy on pinterest and just mix-and-matched things I liked and hoped for the best! 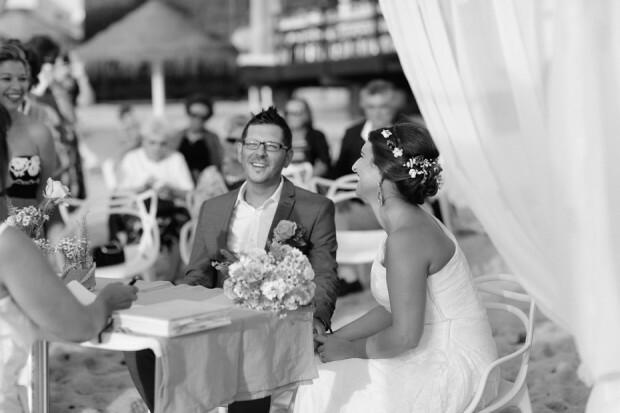 In the end it all worked well together! 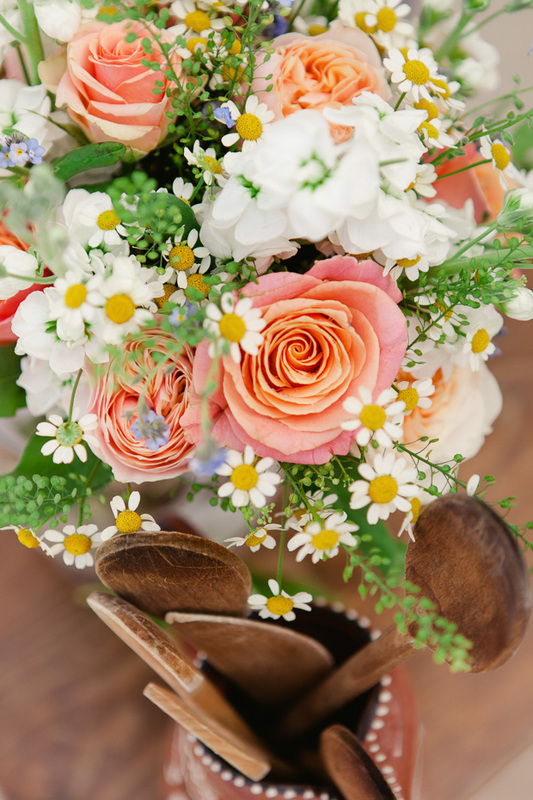 For my flowers I wanted a “just picked” kinda bouquet, the table centres were jam jars with simple flowers… lots of months collecting jars!! 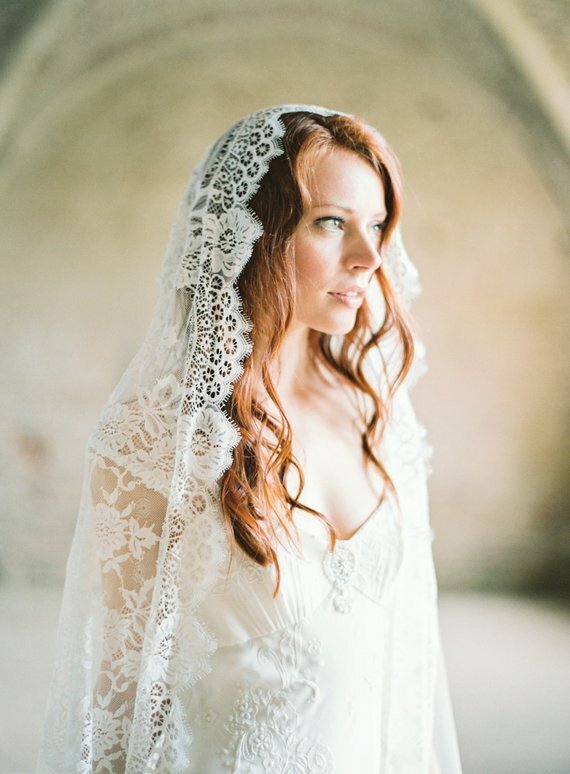 At first glance my wedding dress looks simple, but it has a lot of detail and I fell in love with the Portuguese lace. 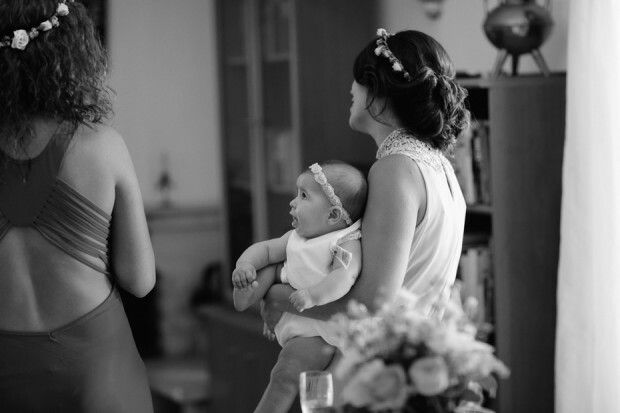 It was perfectly tailored to my body; it made my waist look tiny and was draped at the stomach making me look really slim. 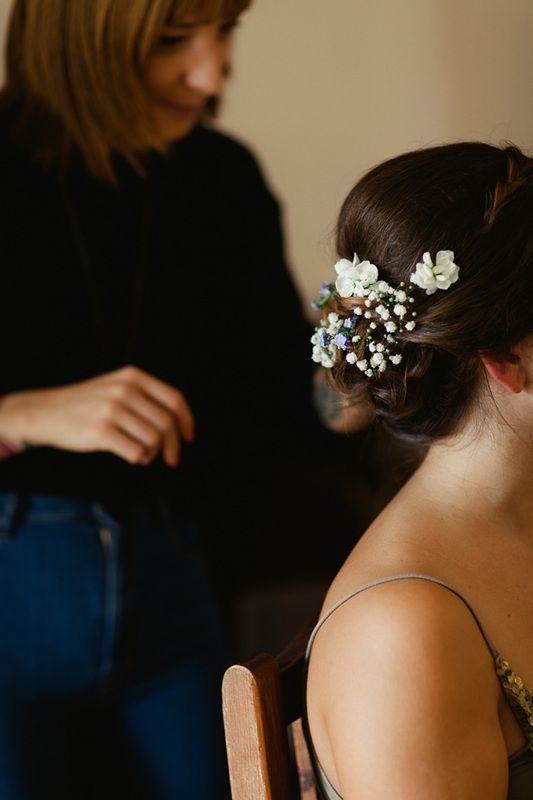 I felt beautiful and comfortable. 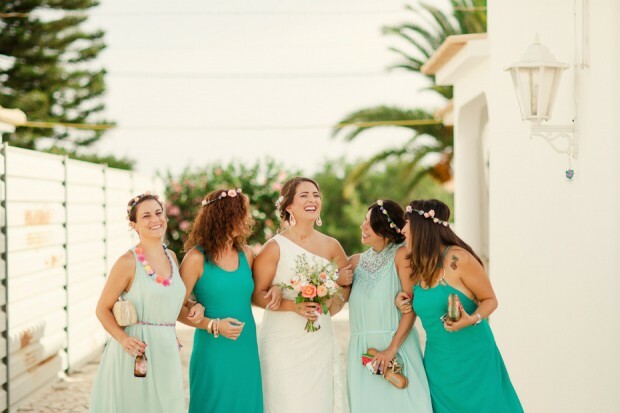 I gave my bridesmaids the total freedom to wear whatever style they wanted – provided the colour scheme was the same. 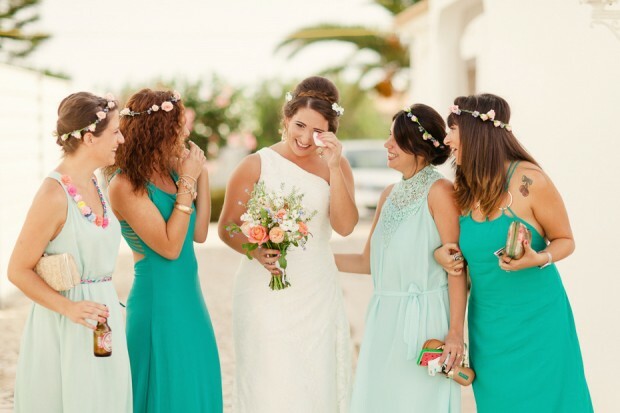 So each maid wore a different dress with different shoes and all bought from different shops. 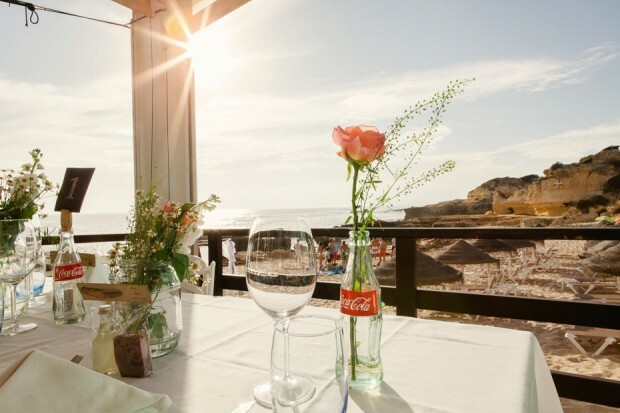 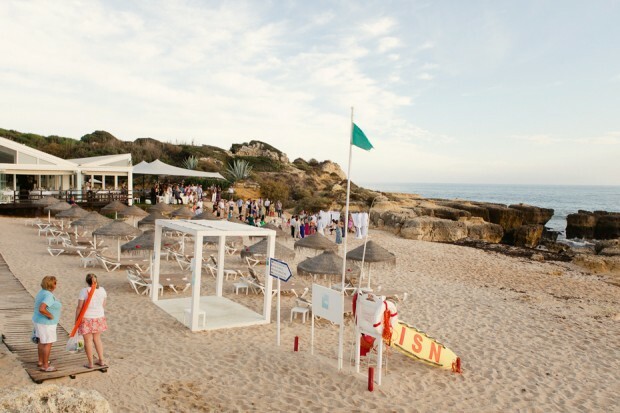 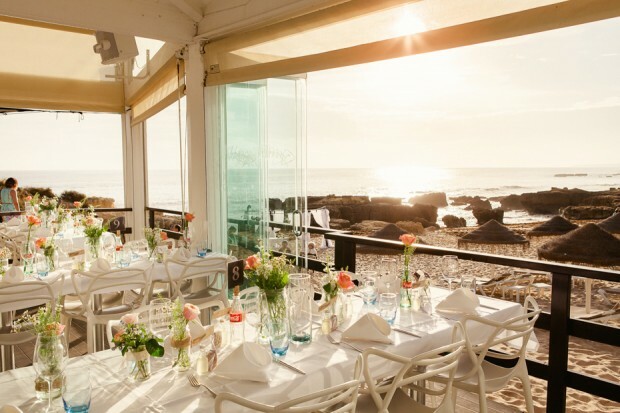 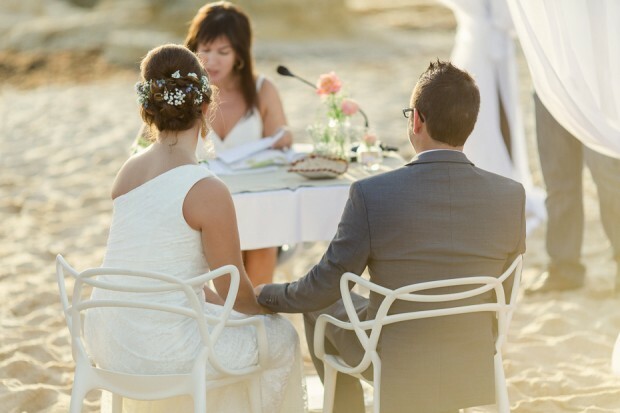 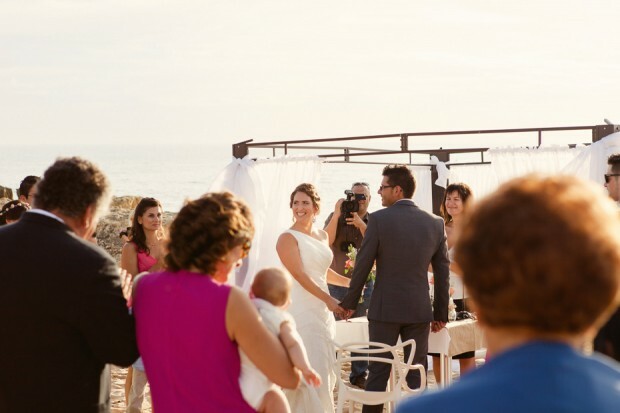 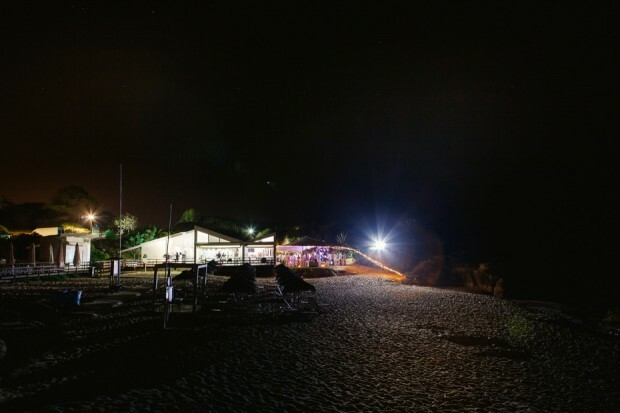 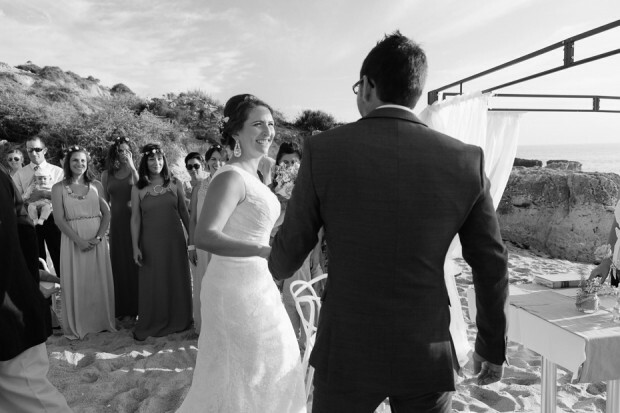 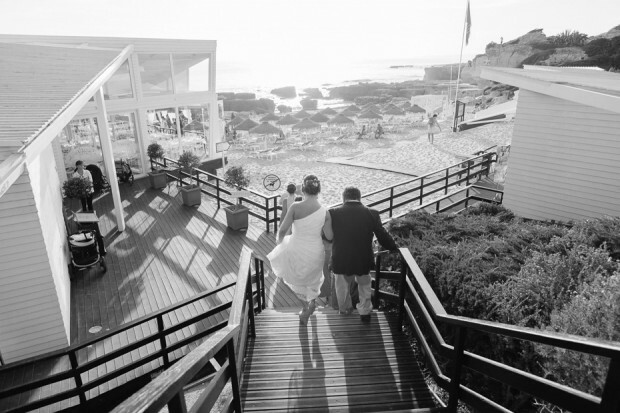 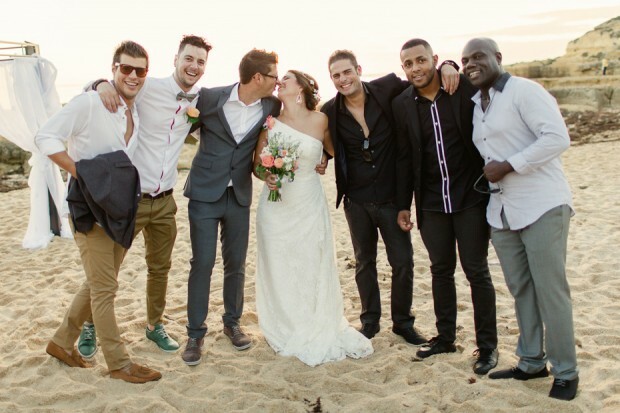 Our wedding ceremony was on the beach and the reception was at Restaurante Evaristo – Evaristo beach, Albufeira. 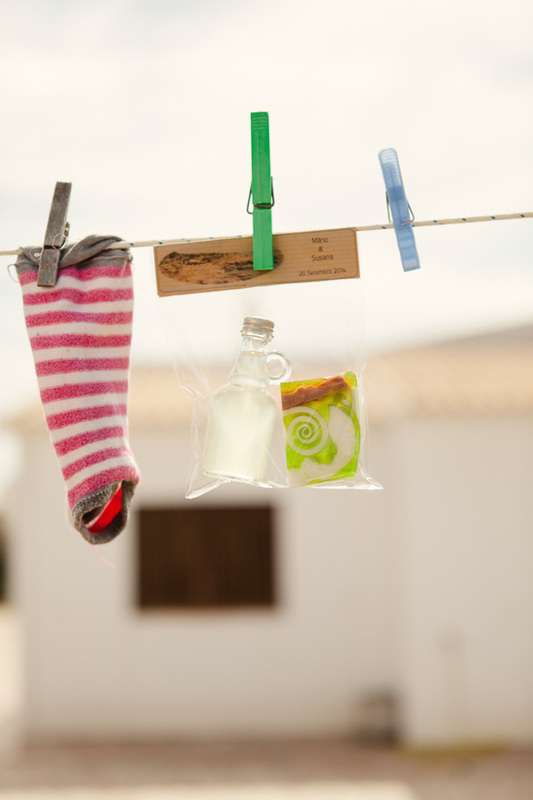 Our wedding favours were Algarve Puro – miniature handmade organic soap & miniature “melosa” (traditional Algarvian honey firewater), made with love by my friends Filipe, João & Gisela. 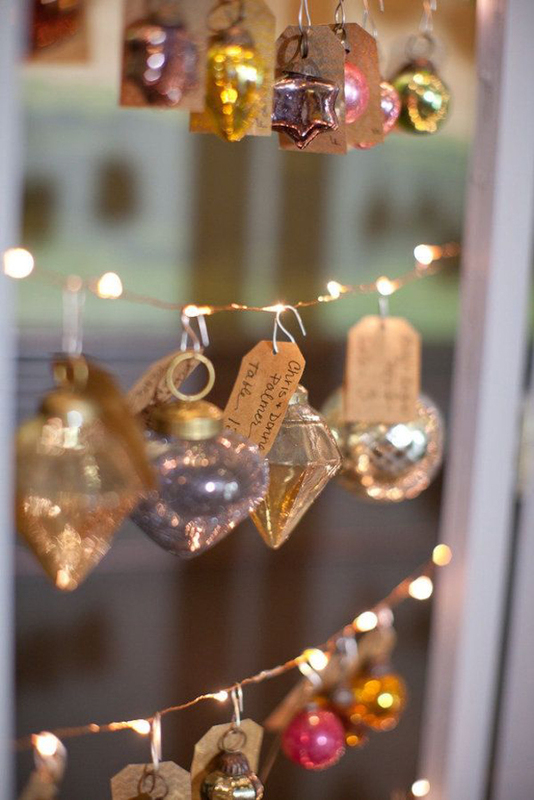 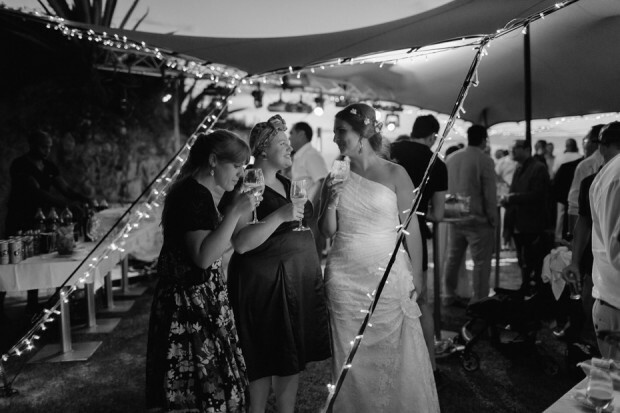 All the wedding decor was glass jars and coke bottles with rustic flowers, we added candles, lanterns, torches and chill-out furniture / sofas to the marquee for the evening. 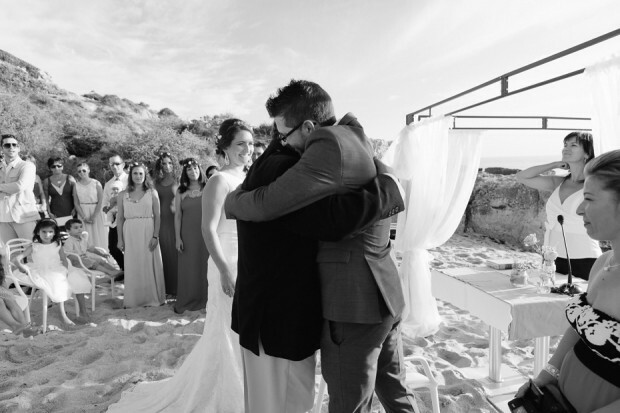 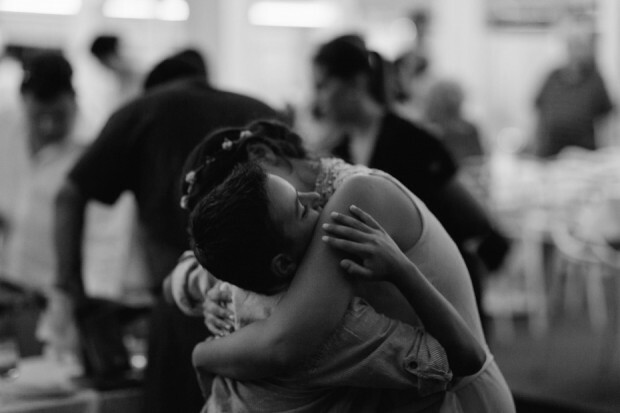 My father gave me away and we walked down the aisle to ”Without you” by Eddie Vedder. 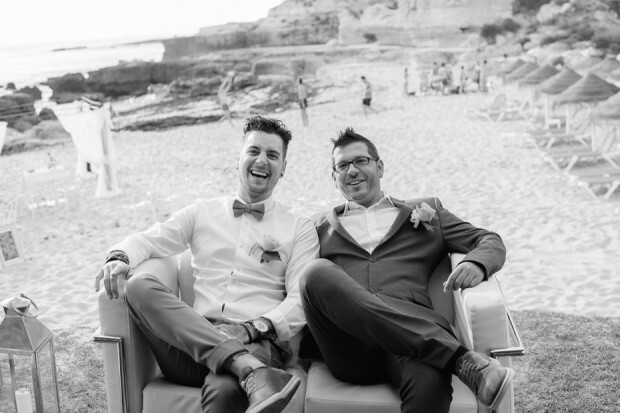 We each went our own way… and 12 years later we met again randomly in a local bar in Albufeira on a rainy night in February. 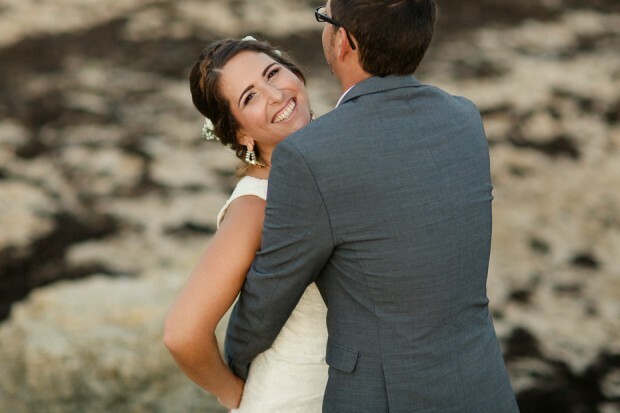 Our wedding photographers were Matt & Lena. 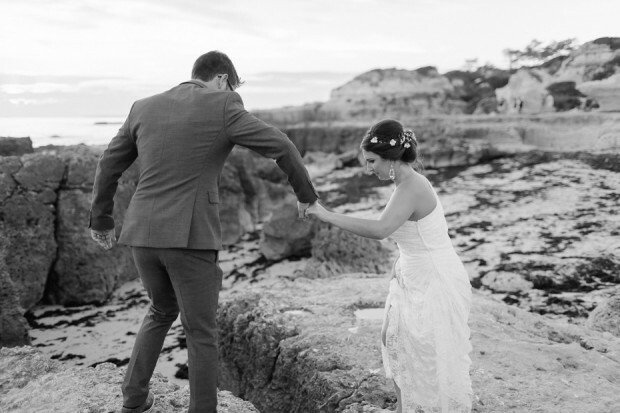 When I first met them I knew immediately I wanted them to photograph my wedding. 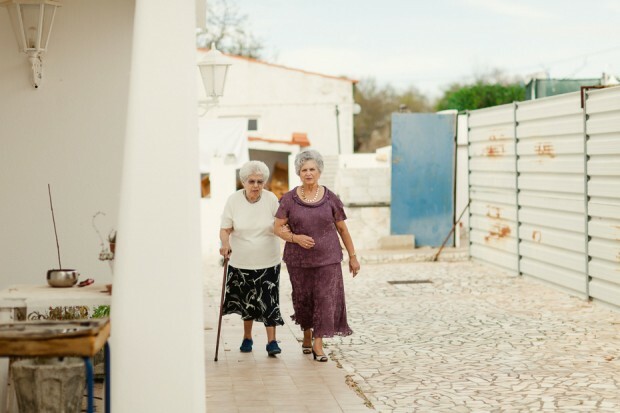 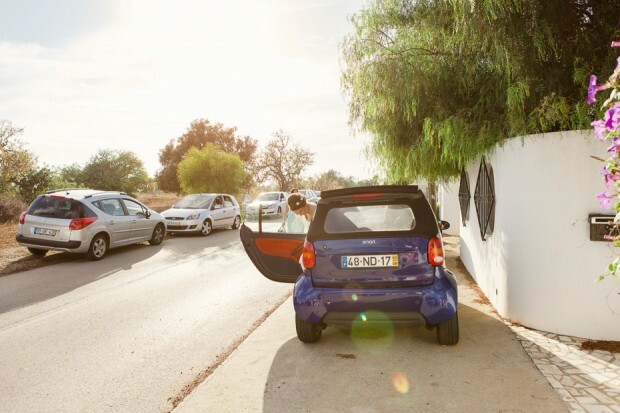 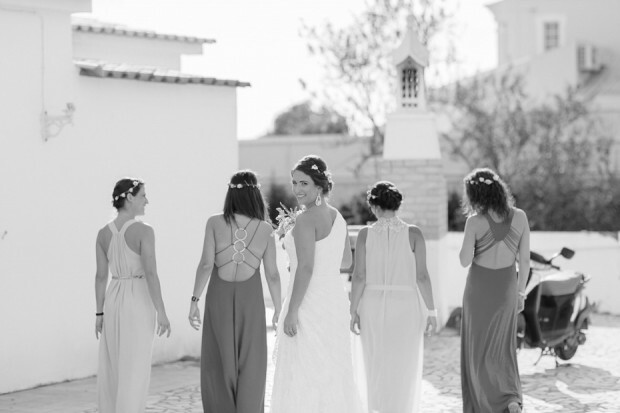 They have a totally new approach to wedding photography in the Algarve that I had never seen, as a wedding planner I already knew everyone’s work and didn’t identify myself with anyone’s style. 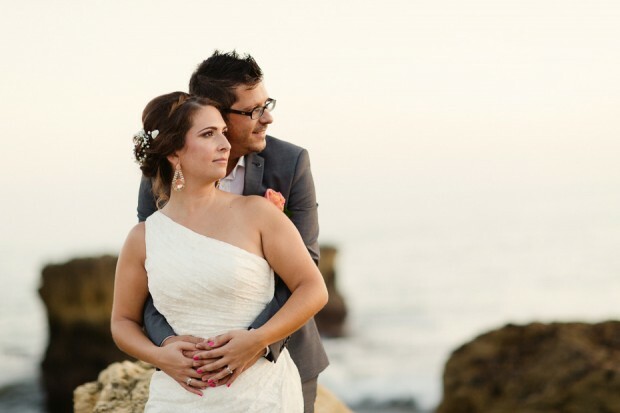 I loved working with them from start to finish. 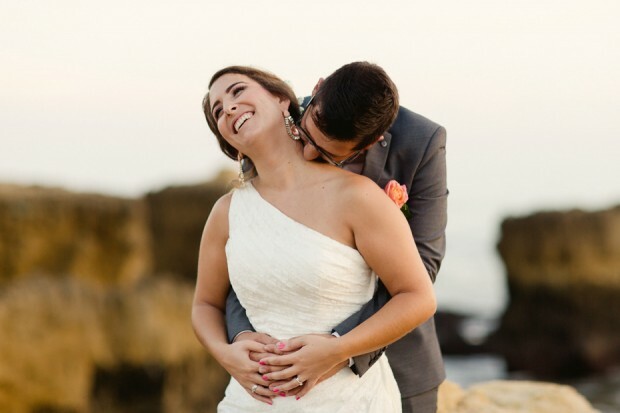 They’re so easy going and approachable, the engagement shoot made us aware of how both Mario and I photograph so on the wedding day it was so natural, easy and quick! 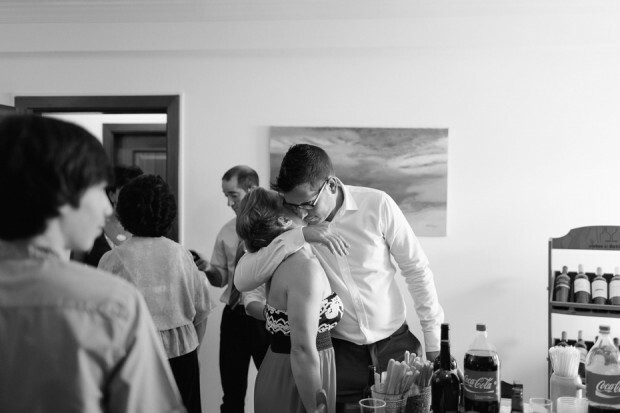 It also gave both Mario and I the opportunity to get to know Lena & Matt a bit better, broke the ice and we felt super comfortable with them! 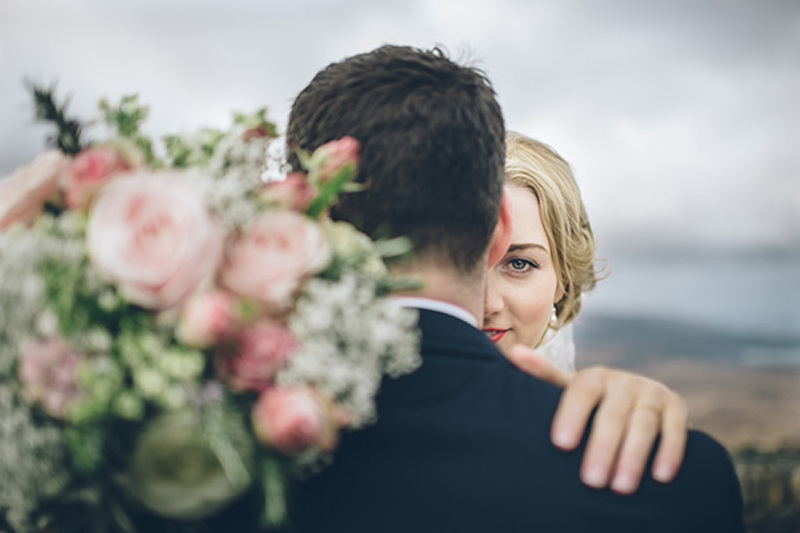 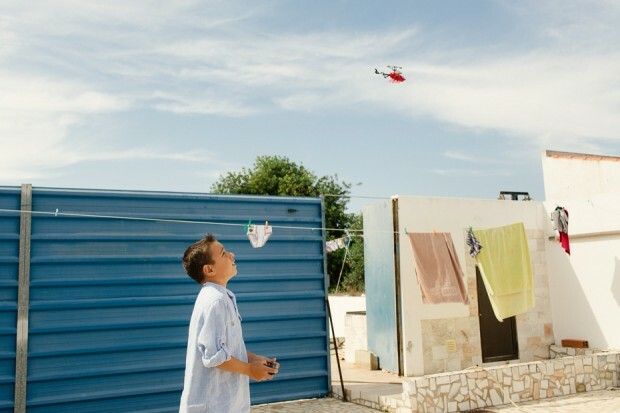 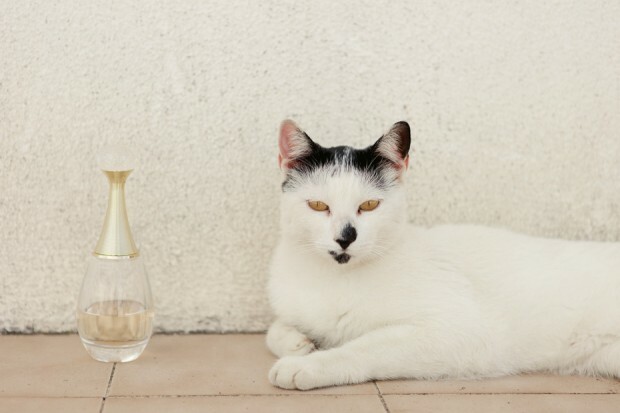 On the day itself, I didn’t even notice them which to me means job well done, the photos are super natural and have transmitted the real emotions. 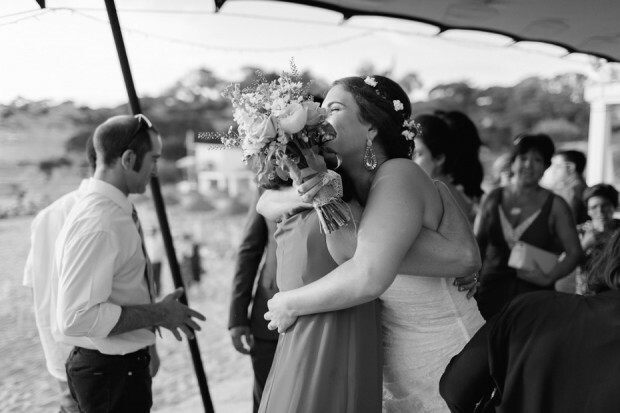 I can’t stop looking through them and feel nostalgic; I’m transported back to that day, to that moment of pure happiness. 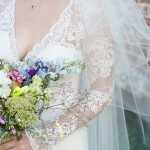 I actually can’t decide on which ones to include in the album, I love all of them! 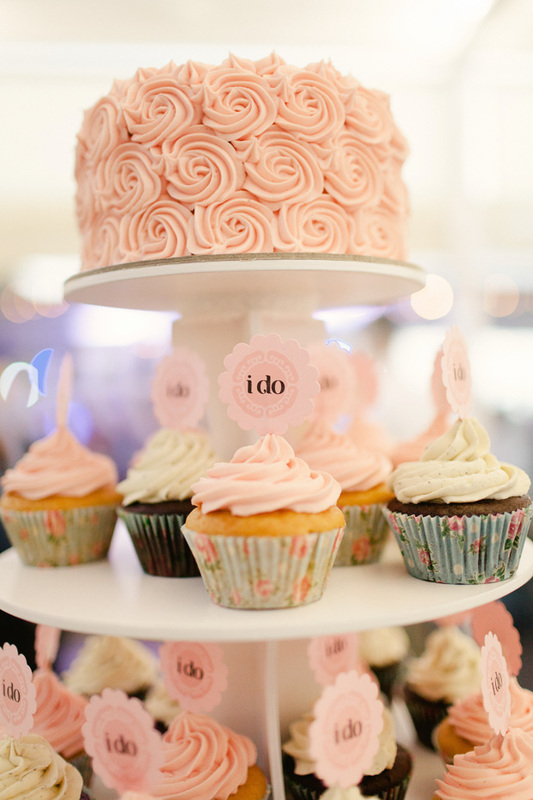 Our wedding cake was a cupcake tower with a big cupcake in the middle. 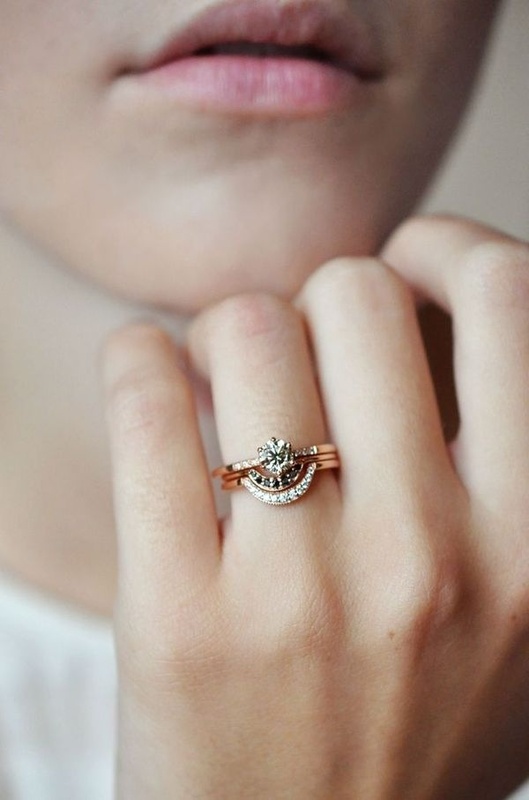 It has little flags saying “I do”. 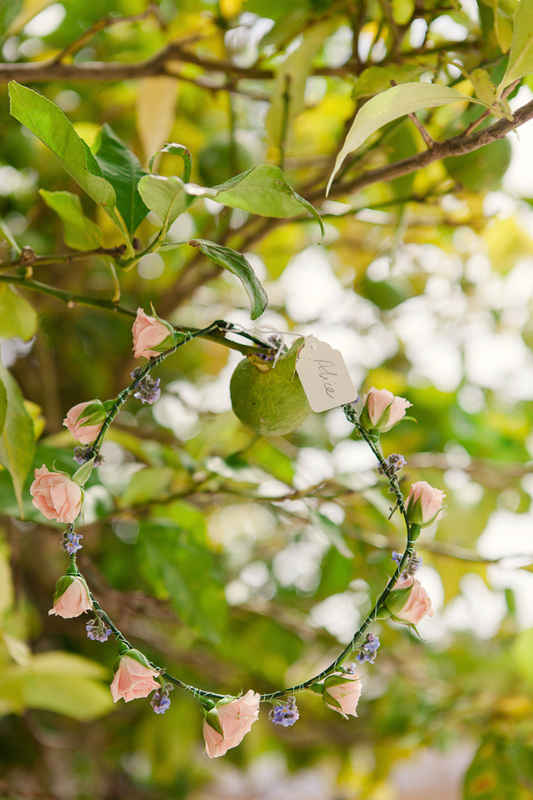 It was made with lots of love by my very talented designer friend Anabela. 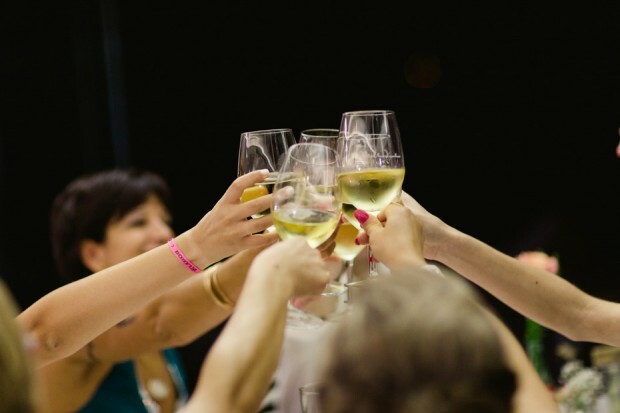 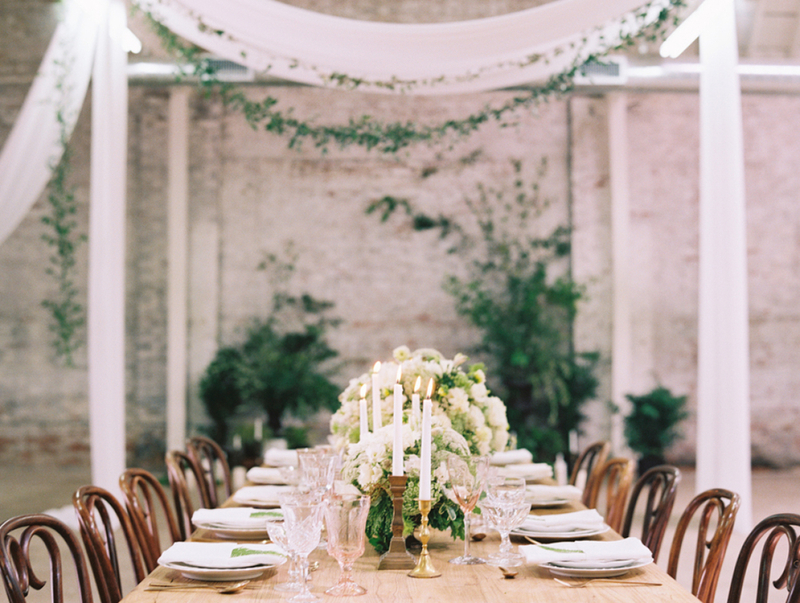 Hire a wedding planner for sure! 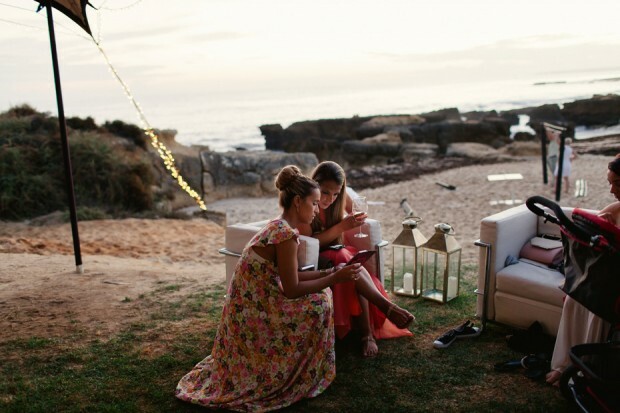 Enjoy the wedding planning process, don’t stress out over the little details – although the details are what make the difference, on the day you don’t even notice them, the day goes by so fast and you’re on such a natural high you don’t care about those little things. 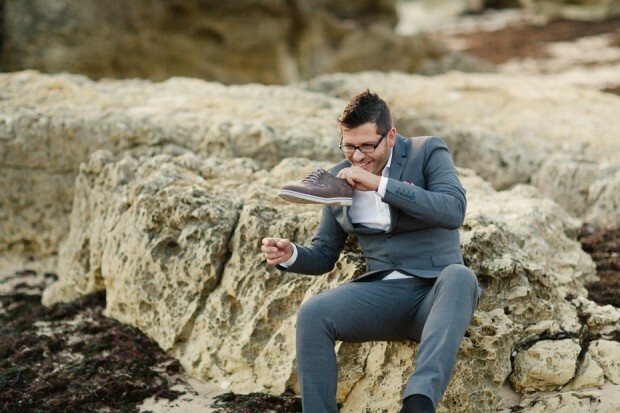 Enjoy your food tasting because you won’t be hungry on the day!! 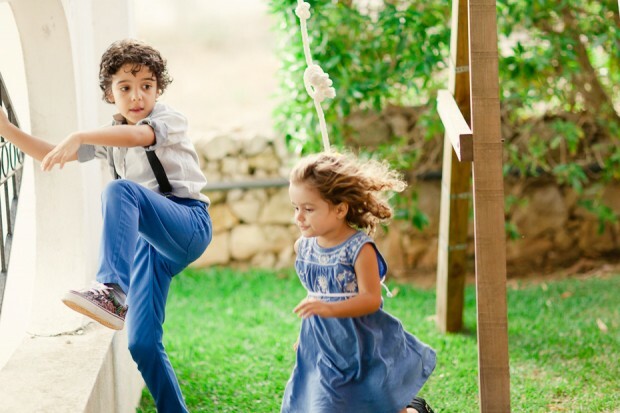 The day goes by so fast, just HAVE FUN!!! 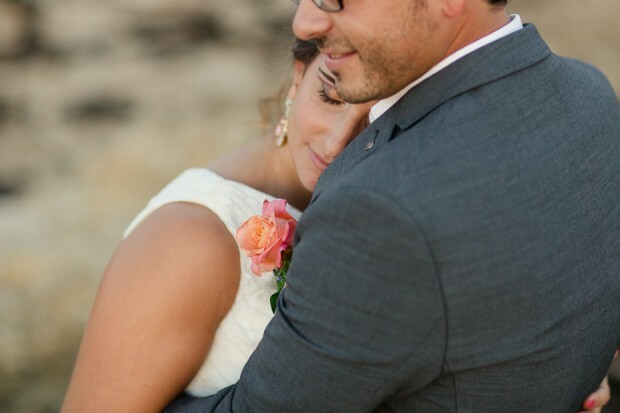 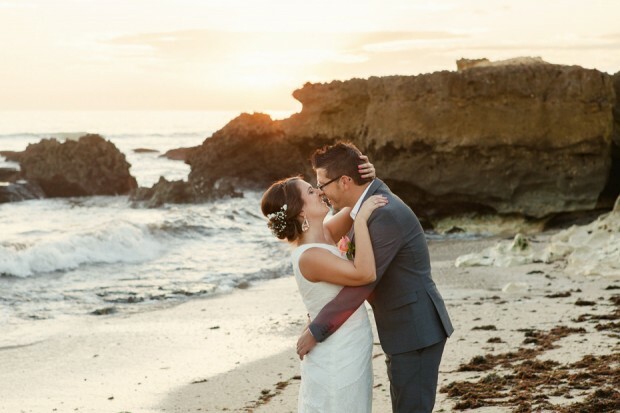 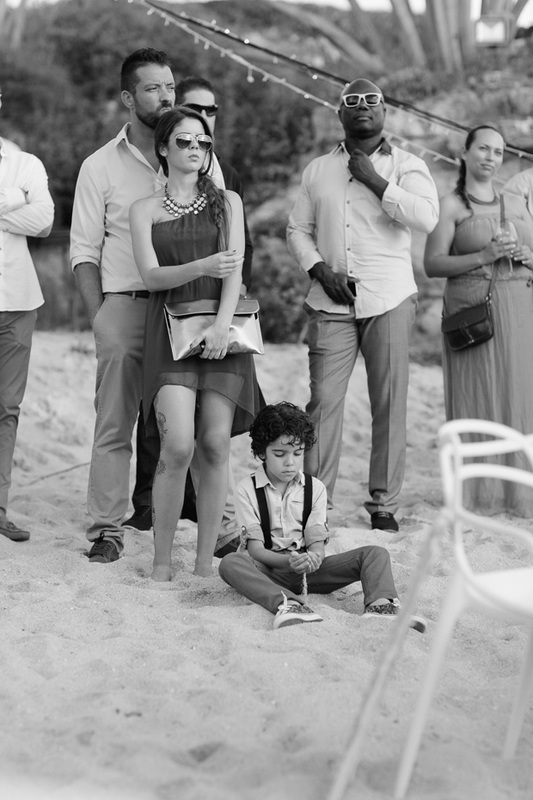 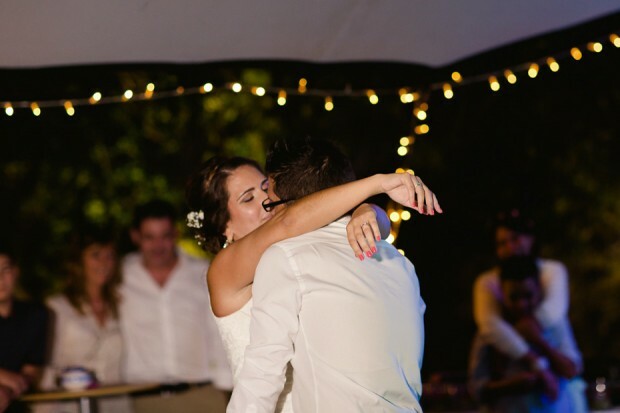 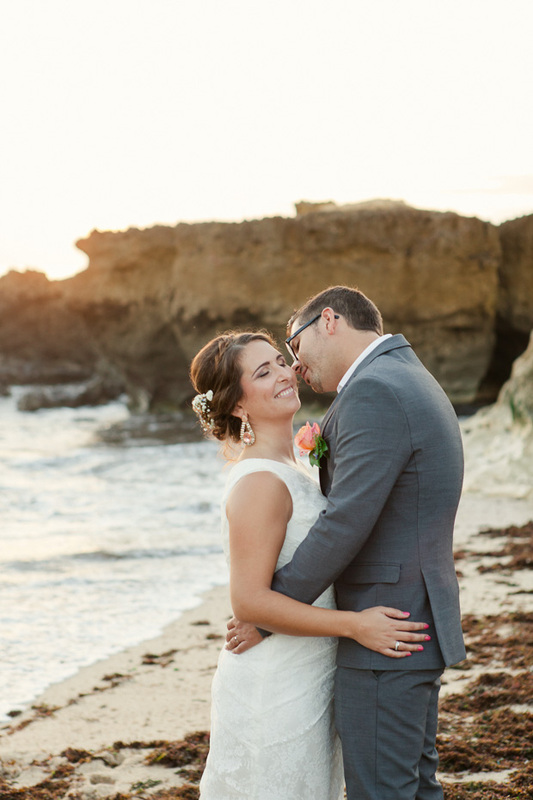 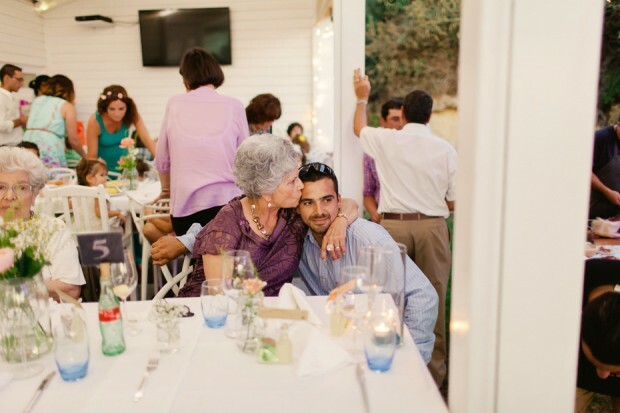 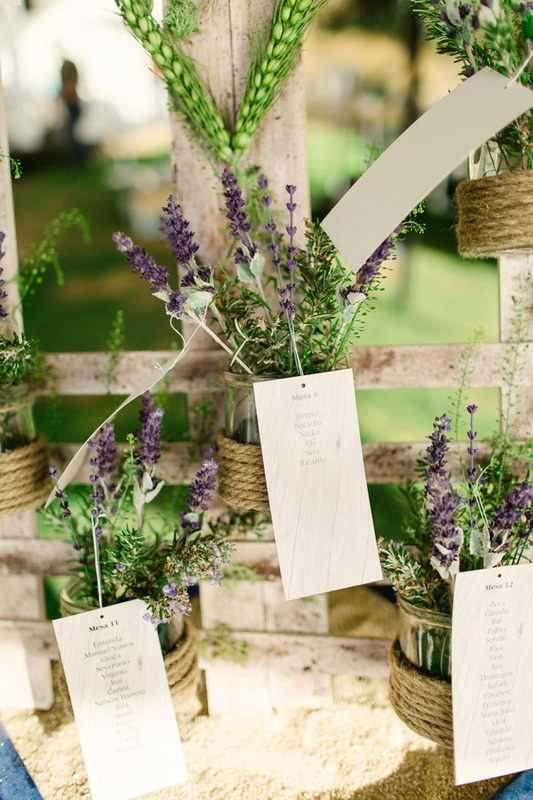 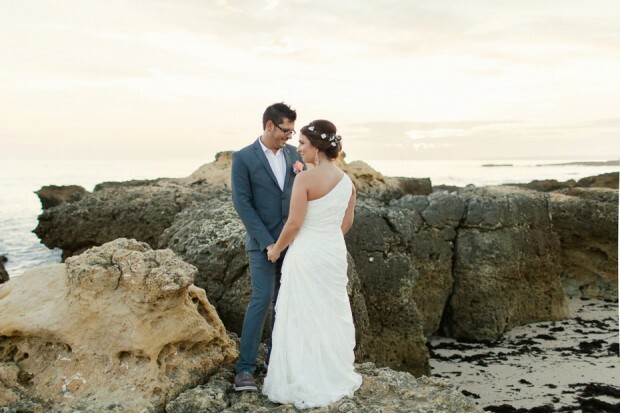 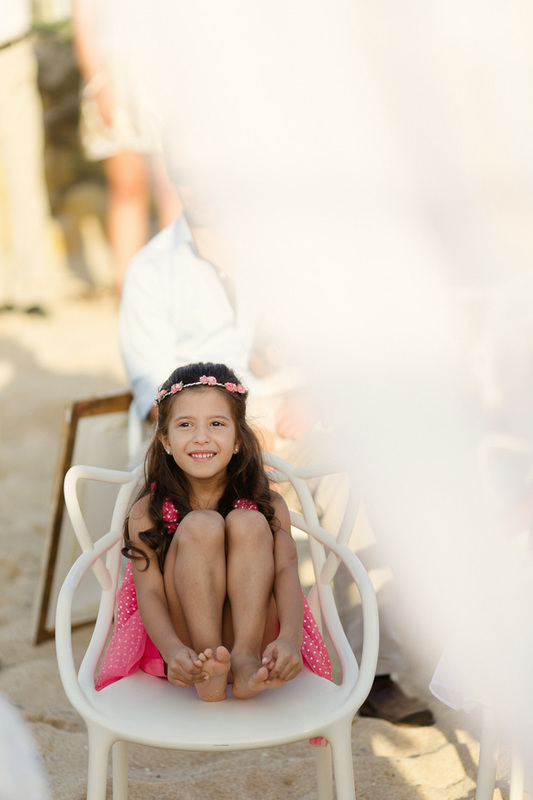 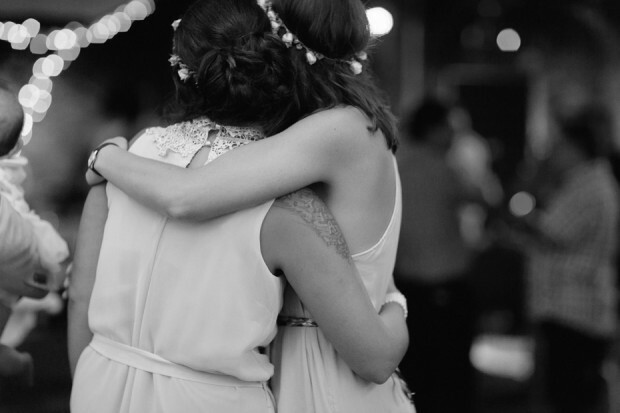 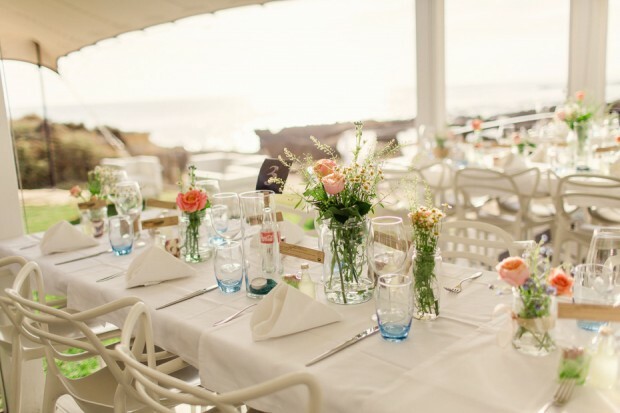 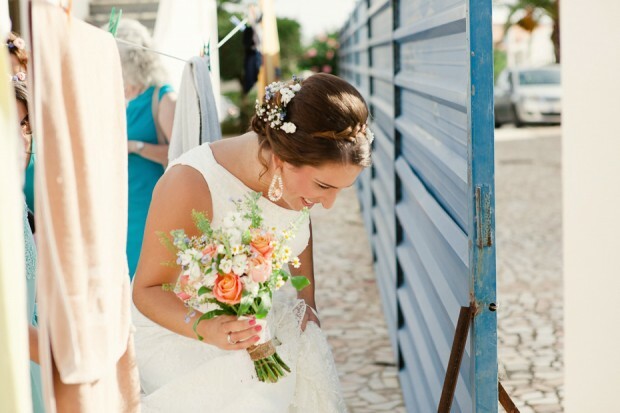 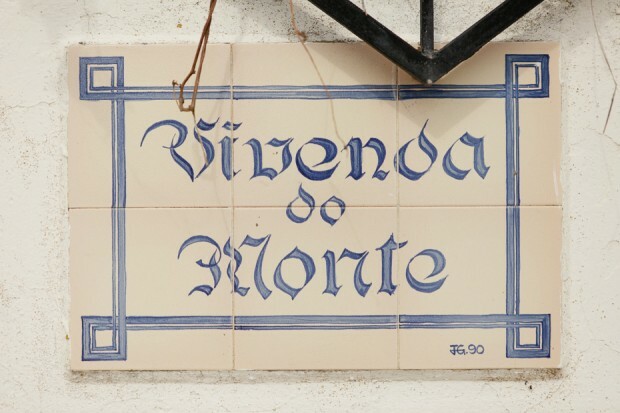 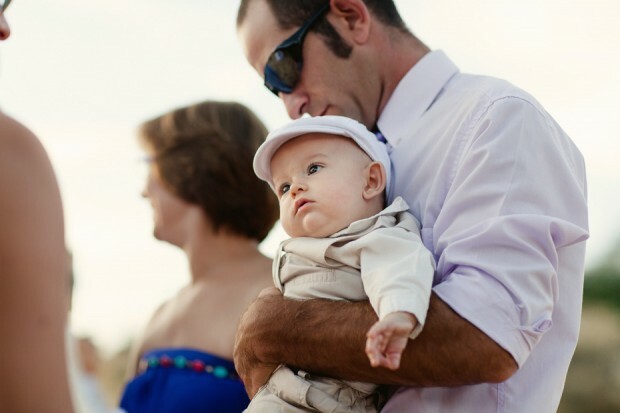 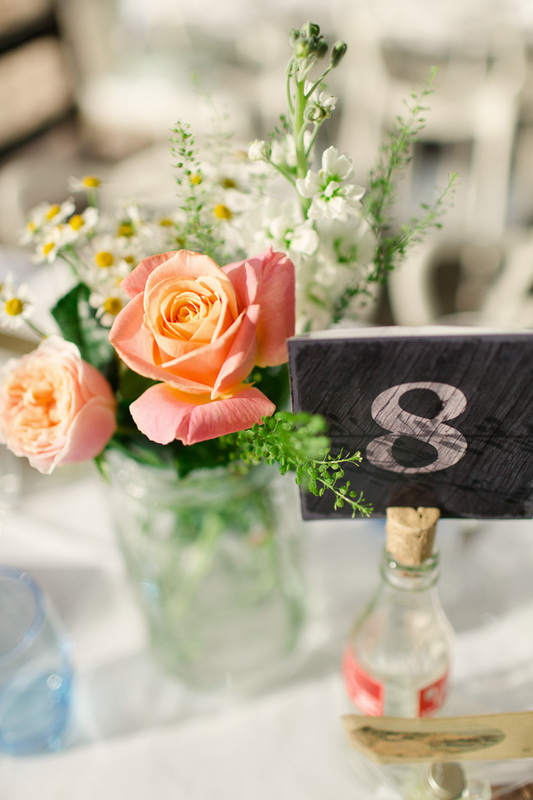 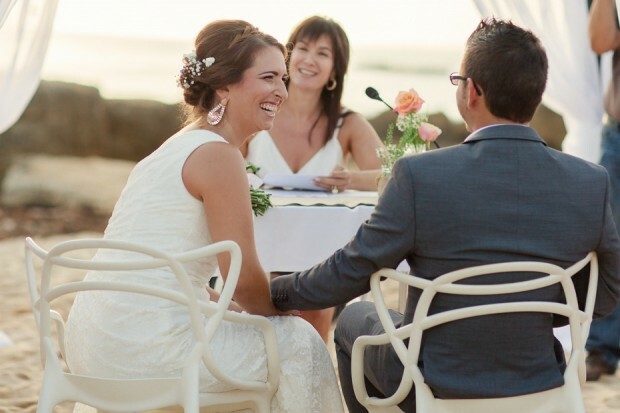 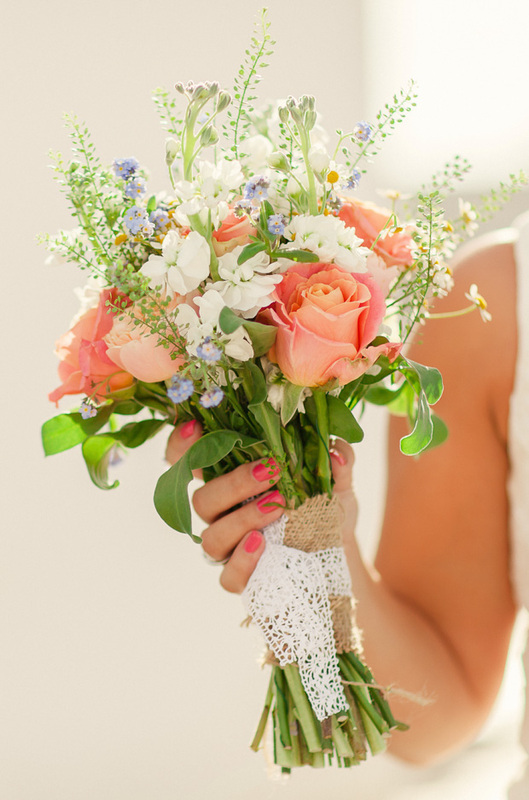 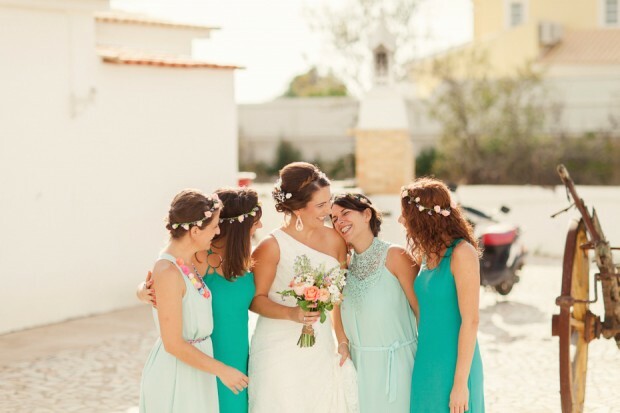 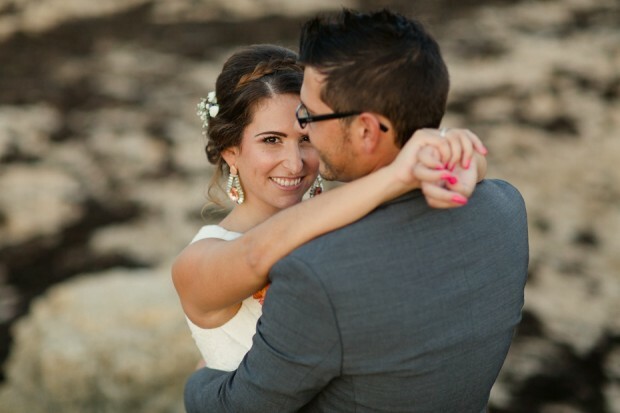 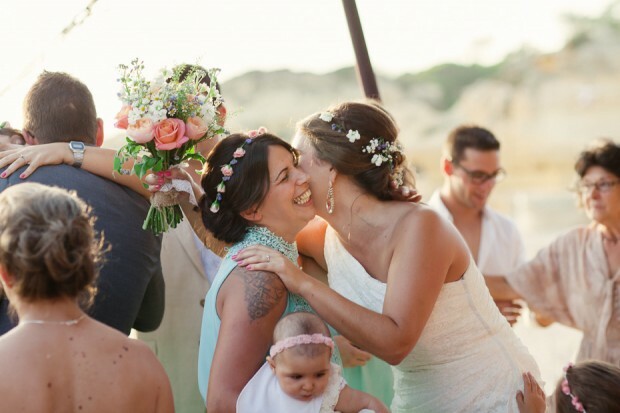 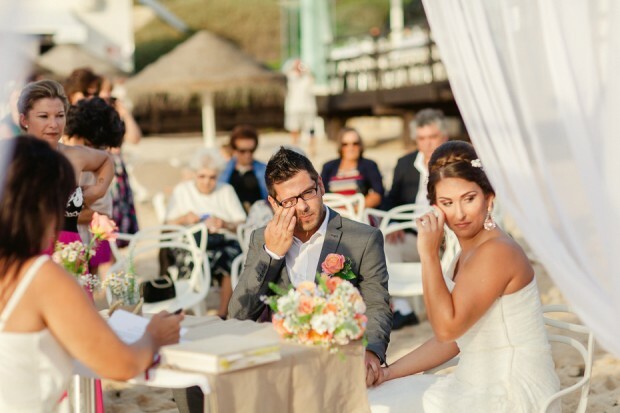 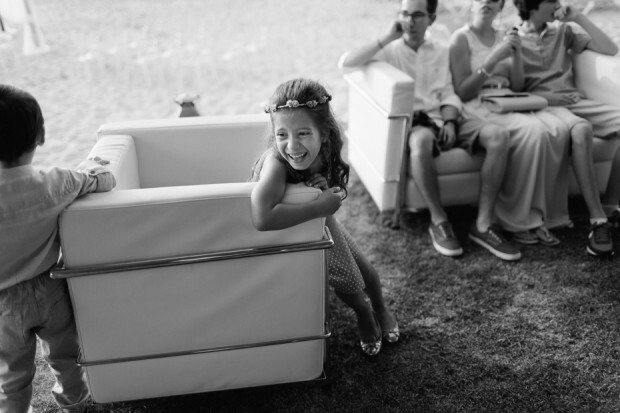 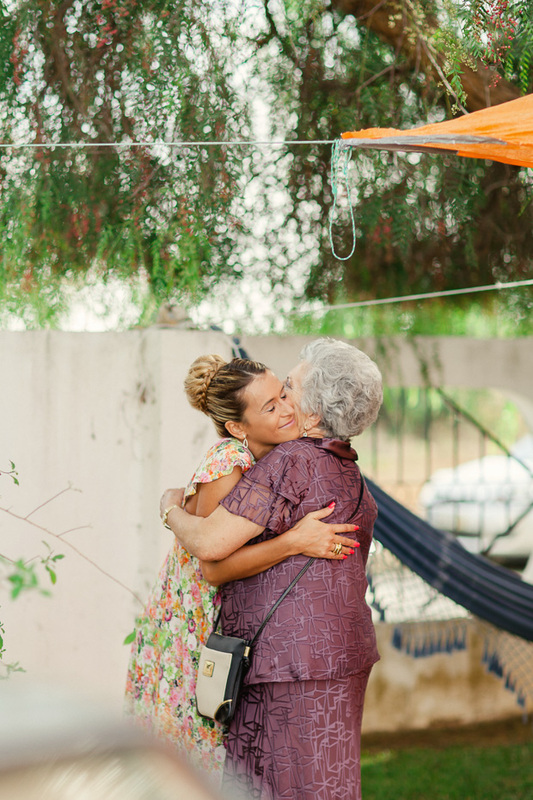 Thank you so much to Matt & Lena Photography for sharing this lovely Portuguese beach wedding! 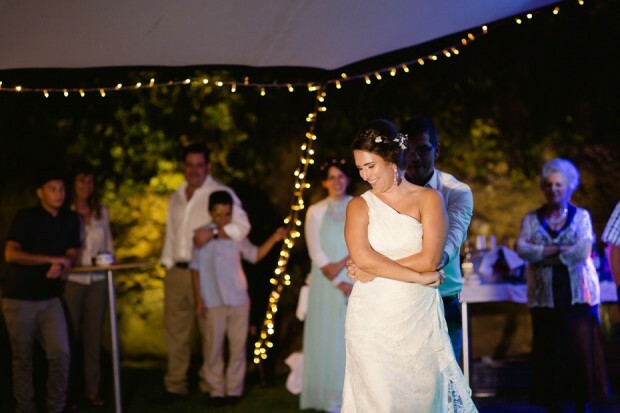 And a big congratulations too to the lovely Susana and Mario, thank you for making us smile and sharing your wedding day with us. 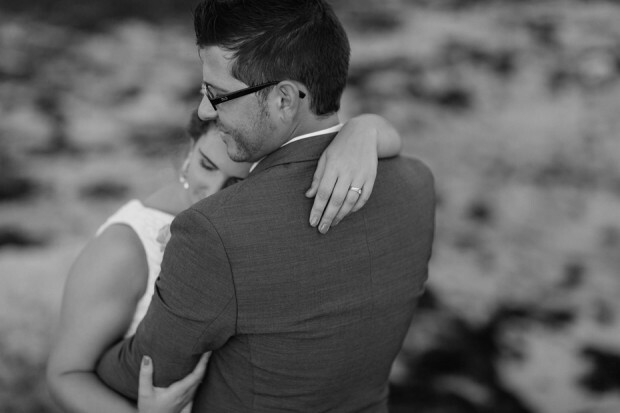 Ladies and gents, please do leave this couple some love.